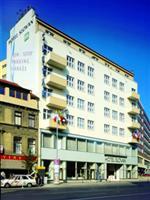 The Slovan Hotel Brno is located in the center of the city. Guests will find historic and cultural attractions throughout the area. The Spilberg Castle is located only a short distance away. The Slovan Hotel Brno is located along the city’s public bus lines, offering easy access to local attractions. The Brno International Airport is located only a short distance away as well and can be reached by bus or by taxi or rental car. The Slovan Hotel Brno offers an array of guestrooms that are all equipped with many modern conveniences. Every room offers guests access to the Internet. Each room also includes a private en-suite bathroom. Guests of the three star Slovan Hotel Brno will find that shopping and dining choices are located throughout the area. The hotel offers an onsite restaurant as well as a night club. Other onsite amenities include a pub, a fitness center, a billiards area, a conference facility, a salon, and a 24 hour reception desk.